I recently answered some questions about adding sugar, buttermilk or beer to moss to encourage it to grow. DON'T add these liquids to moss you will put in a terrarium or other enclosed growing environment. The sugars involved will likely cause fungus or attract pests. So where does this moss quasi-myth come from? 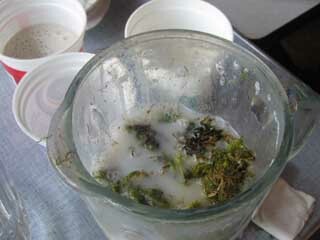 My best guess is the use of beer, buttermilk or sugar water to jumpstart the growth of moss in a shake or moss tea. In this process you collect moss, blend or chop it up and mix with a sugary liquid to encourage the outdoor growth of moss, such as on a wall or between stones in a garden path. The bits of moss regenerate and supposedly grow a nice even layer of new moss. If you are interested in learning more about making and using a moss shake check out this excellent tutorial by Andrea Bellamy at Heavy Petal "Operation: Moss Graffiti." Thanks so much! I tried it on a twig in a terrarium and it just got moldy. I'll be trying it outside soon and will give a full report. Awesome blog! Great to hear! I hope it works out better outdoors!